I am writing this post in answer to Holly's post on funeral planning. Make sure when your done reading this you head over to Holly's blog Caring for Carleigh to read the wonderful ideas and information she had to share. Funeral planning was filled with so many hard decisions. Decisions that would have been hard if my husband and I were just pre-planning our funerals. I wish that was all we were doing the day we walked into our local funeral home. 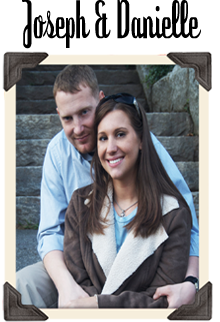 We had just received Wyatt's fatal diagnosis a few weeks before and knew this was something we had to get out of the way in order to enjoy the rest of the pregnancy with him. We didn't want this dark "to do" hanging over top of us. And as weird as this may sound, we knew our sons funeral would most likely be the only thing we would be able to do for him... we wanted it to be perfect. You would not believe how much grief we received over this. Certain people took this as we were giving up on Wyatt. Let me just say, I never gave up on the miracle God could perform even after Wyatt had already died. I know God could even bring Wyatt back as I type this, but I also know it's not his will. However, if God miraculously decides to give Wyatt back to me, he knows I'm right here with open arms. As we got out of the car to walk into the funeral home, I froze. I didn't want to step foot into that building. How in the world was I going to plan a funeral for the baby I could feel moving inside of me? Everything inside of me was screaming to get back in the car and go home. I felt like Wyatt would know what we were doing there. I didn't want him to think we were giving up on him. I wanted to protect him from what was to come. Lets just say I was a teary basket case and without Joseph there holding my hand, I could have never gotten through that day. We were lead to a room where we signed tons of paper work. We flipped through magazines of caskets. We looked at memorial books and programs for the viewing and service. They told us we could go home and look around, and if we found anything we could have them order it for us. The hardest decision we made was whether or not we wanted to bury or cremate Wyatt after he died. I wasn't comfortable with cremating him. The thought of destroying the body he was fighting so hard to form... the body I would nurture for 8 1/2 months... it physically made me sick. BUT, it was really our only option. Joseph is in the military and we could move around a lot. Home would be in Florida where all of our family either lives or is buried. I'm sorry, but the only thought worse than cremating my son, is knowing I had to drive 13 hours to visit him. No thank you. With much reluctance, we signed the paperwork for our son to be cremated while (I remember this vividly) he hiccuped inside of me. 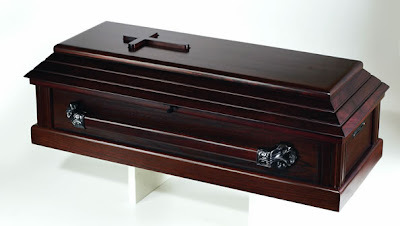 To make a long story short, we ended up getting a Cherry wood casket from Abbey Caskets. They were VERY affordable and handmade here in the United States by monks. We were very impressed with the craftsmanship. We ordered from them directly, and it was shipped to the funeral home. The day Wyatt's casket arrived at the funeral home we received a phone call telling us we could come look at it. We immediately left the house to look at it. When we arrived, we were lead to a back room where it was set up, and we were given some alone time before the funeral director came back. Let me just say, nothing, and I mean nothing, can prepare you for seeing a baby casket. Especially when you know it's meant for your child. I was a beautiful casket, but I didn't want to have anything to do with it. It made our situation seem so very real. I just wanted to leave. I wanted to get as far away from that casket, his casket, as I possibly could. As we were leaving, the funeral director innocently asked if "it was what we wanted". What we wanted? Wrong thing to say there buddy. "No, that's not what we wanted. I wanted to buy my son a crib. NOT a casket," was the reply that just flew out of my mouth before I even realized what I was saying. I was so embarrassed and made a quick exit after a brief apology for what I said. Wyatt's casket. The cross lifts off of the top and can be hung on the wall. For those of you who are wondering why we bought a casket if we were having Wyatt cremated, that's a good question. However, the answer is simple. We wanted to have a viewing and funeral for him. When Wyatt passed, Joseph and I originally planned on taking him to the funeral home together. Joseph ended up taking him without me because I wasn't able to go due to a c-section. 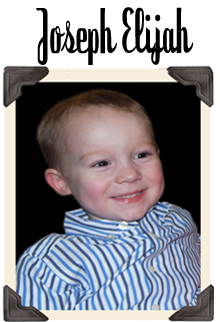 The funeral home needed Wyatt as soon as possible to have him ready for the viewing. Wyatt was in the hospital with us just over 24 hours before Joseph took him. My grandma rode with him and held Wyatt. I wish it could have been me. Sitting in the hospital knowing they were handing my son over was gut wrenching. Looking around an empty, quiet room was horrible in so many ways. I just wanted my son back. I didn't care if it was just his body, I wanted him in my arms again. 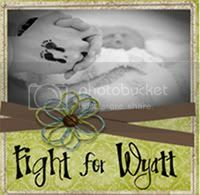 I was released from the hospital on the day of Wyatt's Viewing. Joseph and I took the kids up there early to meet their baby brother. We wanted to do it sooner, but Wyatt was so fragile we wanted to wait until the funeral home had a chance to make him more holdable. They really weren't able to do much because he was simply too fragile. 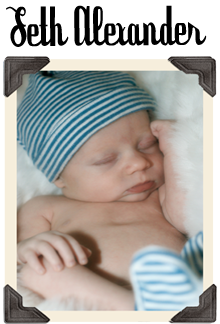 His skin was extremely delicate because of all the fluid that accumulated in his chest cavity while I was pregnant with him. On top of that, his head didn't harden properly and his legs were injured very badly during delivery. Joseph and I didn't even get to hold him during his viewing or funeral although we wanted to. I touched and kissed him as much as I could though. I tried to soak up each moment I had with my son. Ansley meeting Wyatt for the first time. Eli meeting Wyatt for the first time. Ansley telling her baby brother to wake up... that was a tear jerker. Joseph and I with Wyatt at his viewing. We held the viewing at the funeral home. It worked out great because of the location. We had a wonderful turn out. I was a bit distressed that nobody seemed to want to go up to Wyatt's caskets. I guess I just expected everyone to huddle around him and coo about how beautiful he was (In my defense, I was loaded up on pain medication). But it did bother me. The next day we held the services at our church. We had a close friend of the family officiate. I told him I wanted to focus on Wyatt's life instead of his death, and that's exactly what he did. We sang two songs that have always been special to Joseph and I. "It is well with my soul" and " How great thou art". I still can't hear those songs without crying. I wish I could share more about Wyatt's funeral, but honestly, I don't even remember how I made it from the church back to the funeral home. I was in pretty bad shape that day... mix it with pain meds and it's not a good combination. Flower arrangement we chose for Wyatt. How we had his casket and flowers set up at the funeral. Although I don't remember much of Wyatt's funeral... I do remember seeing and holding my son for the last time. It was after the funeral. We followed Wyatt back to the funeral home because I insisted that I wanted to hold him one last time and get some pictures. The funeral director asked me to sit down while he tried to pick Wyatt up. He said if he had any problems he would come over and let me know. He used a pillow to help support and cushion Wyatt's body (yes, he was that fragile) and I was able to hold him again. Although I must admit, I decided to chance it and take the pillow out from underneath him so I could feel him instead of a pillow. Some family that came up for Wyatt's funeral took turns getting pictures taken with him. June 4, 2009 was the day I got my first and last family picture taken. All five us together. When pictures were done, I handed Wyatt back to the funeral director for the last time. He turned around and walked away with my son. That was the last time I saw him. As I walked out of the funeral home, I left with a box. It had clips of Wyatt's hair, his funeral outfit (we brought him a change of clothes and a new blanket to be cremated in), and the blanket I made for him in it. Everything I had left of my son fit into this little box. My entire world could be held in a shoe box. Joseph's aunt took me home and Joseph stayed to tend to Wyatt's cremation. I have to give Joseph props. He saw our son to the very end. He actually drove Wyatt to the cremation site, carried him inside, tucked him in one last time for me, placed him in the cremation chamber, and turned it on. He said it just didn't feel right to have someone else do it. Where my husband finds his strength is beyond me. But my husband brought Wyatt home to me that day. And I've carried Wyatt with me everywhere I go since then. 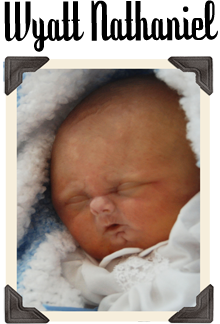 If you would like to read more about the urn I chose for Wyatt click here. It really does have a sweet story behind it. I hope this may help in some way if you are going through the impossible task of planning a funeral for your child. If you find yourself on this journey, I am so incredibly sorry. My hope, is that my experience can help someone through a difficult time. Danielle, thank you for sharing this. When I read your posts, they reminds how incredibly blessed I truly am. I can't imagine what you have gone through, but I know that God is with you every step of this journey. Oh Danielle, that was so hard to read. Thank you for sharing your sons funeral. I did read Holly's story yesterday. I don't know how anyone makes it through but you do. You did your son proud. Thank you so much for writing such a great post, Danielle. It is really helpful and I put a link to it on my funeral planning post. 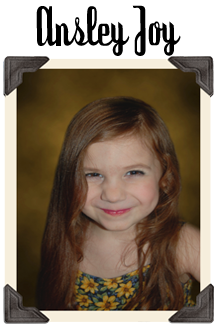 We got Carleigh's diagnosis Dec 15 and Jan 5 was our first meeting with the funeral home. I didn't want to put it off. You know, it is very, very wrong walking into a funeral home pregnant and making arrangement for a baby that is not yet born-still alive and kicking inside your womb. No pregnant woman should ever have to be in a funeral home like that. That had to be so hard to decide to cremate him and I totally understand why you did. If I knew Anth and I wouldn't be staying in our area I would've chosen cremation. I always want us to be in the same place. Wyatt's casket is beautiful! The wood is such a rich color and I love how monks made it and in the US! I originally wanted my aunt and uncle to make a wooden casket for Carleigh but we ended up not going that route for various reasons. Gosh, I remember seeing Carleigh's casket for the first time... While it was beautiful, it was also ugly. I cannot get past how much it must have just crushed you to plan for the end before it even started. I am so so sorry. Your son is precious and I know a lot of heart went behind every decision made in Wyatt's funeral. All I can say is that God's hand is sufficient for you to be able to live through this and stand to tell about it. Thank you for sharing this, I know it will help someone who has to travel this horrible horrible journey. The casket was beautiful. I wish I would have known the time for the funeral. I would have come and told you how precious your son looked in that blanket. I don't know how Joseph did those things and didn't crack. I know how numb you feel when you are planning a funeral. ( not to mean my experiences have been anywhere near as hurtful to the soul) I couldn't help but laugh when you made the comment to the funeral director. There was nothing funny about it, but it reminded me of what I said to him when we were planning my dad's funeral. I'm sure they're used to those kinds of comments. And he deserved the comment you gave him. He should have thought his question a little more through before he asked. Thanks for being so strong to relive those moments and type it out. I'm sure you did help someone with such hard decisions. I just want to say thank you for sharing you moments of Wyatt with us. I'm glad you focused on his life. It is so hard to look passed that sometimes.